a meaningful gift for the university. A gift of real estate is a great way to provide scholarship support, endow a faculty position, assist with the construction of new facilities, and provide program enhancements. The UW considers accepting all forms of real property. These include residential, commercial and industrial properties, undeveloped land and ownership interests (e.g. limited partnerships). We have an established track record of evaluating a variety of income-producing properties, including apartment, retail and office buildings. If you own property that is fully paid off and has appreciated in value, you can deduct the fair market value of your gift, avoid all capital gains taxes and remove that asset from your taxable estate. An outright gift of your real estate. 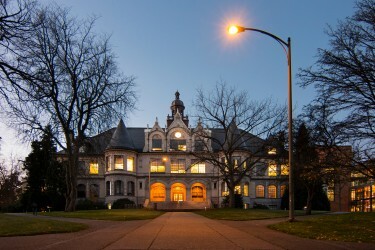 In this case, the UW generally sells the property so that the proceeds can support the program or fund of your choice. A gift of real estate that creates a trust that provides payments to you or beneficiary you designate. This is called a charitable remainder unitrust, and in these cases the property is sold and the proceeds are reinvested in a portfolio of securities to produce the life income. A gift of real estate wherein you will retain certain interests, such as the right to live in your home for the duration of your life, or give the remainder to the University. With a retained life estate in a personal residence, vacation home or farm, you contribute the property to the UW — but the gift is treated as your property for life. The Office of Planned Giving can give you further information about the tax and financial benefits of these and other gift methods. Contributing appreciated property to the UW provides significant tax benefits. If the property is donated outright, you can typically deduct the full fair market value of the gift up to 30 percent of your adjusted gross income in the year of the gift, with an additional five-year “carry-forward” for any unused deduction. With a unitrust or retained life estate gift, the tax deduction equals the remainder value of the property (which is less than the fair market value). With all gifts of real estate, the UW Real Estate Office performs a due diligence evaluation of the property to determine its acceptability. This evaluation has two purposes: to ensure a meaningful gift will result, and to ensure that the university and the donor share an understanding about what will happen with the property. First, the Real Estate Office obtains a preliminary title report. It assesses the marketability of the property. This assessment includes an evaluation of the property’s status with respect to outstanding mortgages, liens and presence of hazardous substances. If hazardous substances or dangerous conditions are discovered, the university and the donor will discuss what action the donor can take to bring the property to a condition that is acceptable for transfer to the UW. What happens to my property after the gift? Usually, the UW will try to sell the property as soon as possible to fund your chosen purpose. There are times when the UW doesn’t sell donated property. The most common examples are properties that the UW wishes to use for academic research or administration purposes. The UW’s decision to retain ownership of a property is heavily influenced by the perceived value of the property to the university, the donor’s gift purpose, current market conditions and the anticipated carrying costs. The UW treats all potential real property gifts individually. We strive to hold full and open discussions with donors to ensure the very best outcome for both the donor and the University of Washington.